3.5mm audio plug, compatible with various of smartphones, cameras, laptop, computers and so on. Features Omni-directional and CVC noise-canceling, clear audio effect, widely used in video recording, interview, webcast, outdoor lectures, etc. Clip-on design, can be clipped to the neckline of your tie or shirt, free your hands while recording. 1.5m / 4.9ft long cable line, can meet most of needs of moving. Small size, net weight only 18g, lightweight and portable. Supplied with an extra clip and foam windscreen, with a PU storage bag, easy to carry. 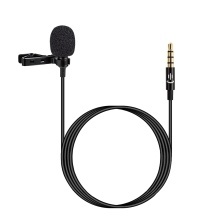 Only the microphone is included.